In today’s environment of largely globalizing national economies, international economic integration does not stop at the frontiers of the European Union. Many non-EU-based enterprises are carrying on business in the European Union through the operation of branches or subsidiaries established in EU Member States, and a large number of EU-based enterprises maintain a diversified range of investments outside the Union. Accordingly, in both inward and outward investment relationships, ‘economic openness’ is key nowadays. This legal relationship between EU Member States and the EU as a whole vis-à-vis the rest of the world is the starting point of this book. 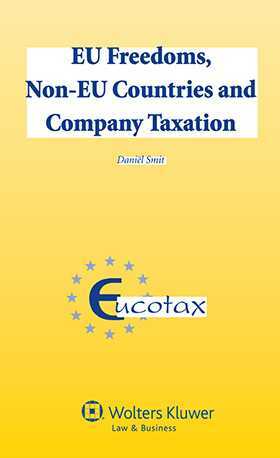 The author analyses the ‘freedom of investment’ concept between EU Member States and non-EU States under EU law, and specifically its effect on company taxation regimes, from the perspective of multinational enterprises. company taxation upon the transnational transfer of business assets. Part I Methodological Framework and Benchmark. Chapter 1 Research Question, Scope and Methodology. Chapter 2 The Benchmark of International Tax Neutrality and the Requirement of a Genuine Economic Link under Freedom of Investment. Part II The Intra-union Context: Legal Integration between Member States in the Field of Corporate Income Taxation. Chapter 3 The Notion of ‘Third Countries’ under Freedom of Investment. Chapter 4 Relevant Positive Integration between Member States and between Member States and Third Countries. Chapter 5 Relevant Negative Integration between Member States. Part III The Third-Country Context: The Impact of Freedom of Investment between the Member States and Third Countries in the Field of Corporate Income Taxation. Chapter 6 Freedom of Investment between the Member States and Third Countries: Access . Chapter 7 Freedom of Investment between the Member States and Third Countries: Discrimination and Justification Grounds. Chapter 8 Freedom of Investment between the Member States and Third Countries: The Temporal Scope. Part IV The ‘Mixed’ Context: The Impact of Freedom of Investment on Indirectly Held Third-Country Investments in the Field of Corporate Income Taxation. Chapter 9 Freedom of Investment and Indirectly Held Third-Country Investments in the Field of Corporate Income Taxation. Part V Recommendations for Legislative Action, Summary and Conclusions. Chapter 10 Recommendations for Concerted Legislative Action. Chapter 11 Summary and Conclusions.